As Professor Casper mentioned, Postmodernism is not only a reaction but also an extension of modernism. Postmodernism disregards the reality. It does not matter who’s lying and who's not, or who’s real and who's not. The three main characters, along with the cases happened in the movie seem too dark to an unreal level. Jack Vincennes did many unfair trades, Bud White had a violent tendency due to a childhood shadow, Ed Exley’s political coldness and psychological malformations come from his father’s death. Both the police and gangsters are miserable and out of control. The four questions asked by Capt. Dudley Smith: “Would you be willing to plant corroborative evidence on a suspect you knew was guilty in order to ensure an indictment?” “Would you be willing to rig crime scene evidence to support a prosecuting attorney's working hypothesis...?” “Would you be willing to beat confessions out of suspects you knew to be guilty?” “Would you be willing to shoot hardened criminals in the back to offset the chance?” display the darkness and hopeless of society completely. Pastiche is another element of postmodernism movies. L.A. 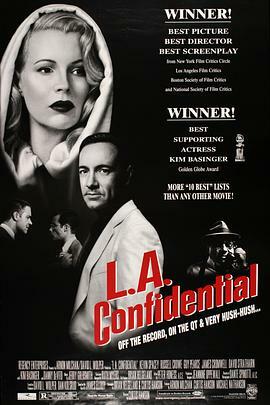 Confidential looks like an old movie, but there is no trace of satire or even parody of the past. However, it helps us to recall past stuff the production team has used and recycled. It is not plagiarism, but an expressive design of the new film. Postmodernism also represents a nostalgia of the past. As a 1997 movie, it sets its background to the 1940s, the golden age of noir film. The time is used to emphasize the topic: a society with violent and bloody exchanges between money and power, and with media used to cover the lies of politicians and capitalists.